Jay McGuiness as Josh Baskin in production art for "Big"
It's time! 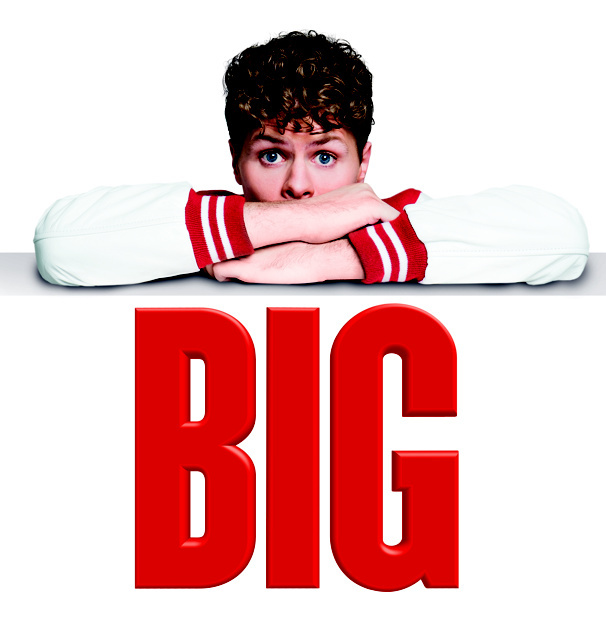 Big, the celebrated 1996 Broadway musical based on the 1988 film, will make its long overdue West End premiere at the Dominion Theatre this fall. Morgan Young will direct and choreograph the production, a transfer from the 2016 Theatre Royal Plymouth staging, set to play a limited nine-week run from September 6 through November 2. Jay McGuiness will repeat his acclaimed performance as Josh Baskin. Big centers on 12-year-old Josh, who wants nothing more than to be big. When a mysterious Zoltar machine grants his wish, he finds himself trapped inside an adult's body as he is forced to live and work in a grown-up world. He is surprised when his childlike innocence has a transforming effect on the adults he encounters. Big features a Tony-nominated book by John Weidman and a Tony-nominated score by David Shire (music) and Richard Maltby (lyrics). The West End production will feature musical supervision by Stuart Morley, with set and costume design by Simon Higlett, lighting design by Tim Lutkin, video design by Ian Galloway and sound design by Terry Jardine and Avgoustos Psillas.